Remember that "Gym Blue" colorway of the Nike Kobe 9 EM that we brought you a few weeks back? Well it turns out that those sneakers will, in fact, be seeing a release date, as we learned today that they are set for a November 21 launch. Unlike most other entries into the Kobe 9 collection, this "Gym Blue" colorway does not feature a graphic upper. 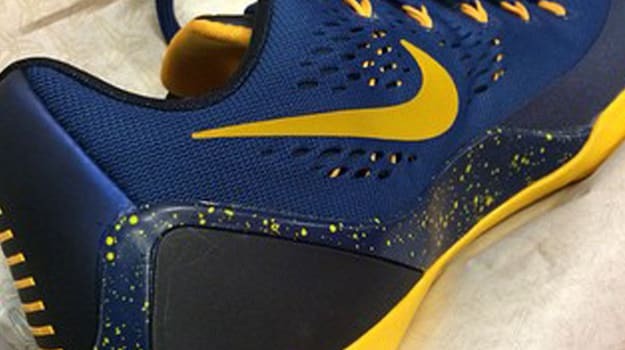 Instead, we get a solid blue mesh upper with yellow speckling on the midsole. Originally likened to the Golden State Warriors color scheme, the shoe is now being nicknamed the "Cal Bears" colorway, although there are no official ties between the sneaker and the school. After all, Cal is currently outfitted by Jordan Brand. Check out the Nike Kobe 9 EM "Gym Blue" below and pick up a pair over at Nike for $175 when they drop on November 21.